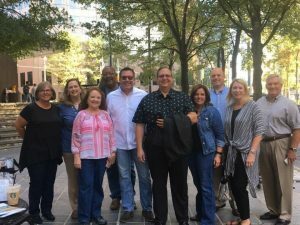 In October, County EDC Directors attended a marketing event in Atlanta, Georgia that was hosted by RTRP, NC Electric Cooperatives, PSNC and ElectriCities. The event was catered to site-selection consultants and foreign consulate staff. 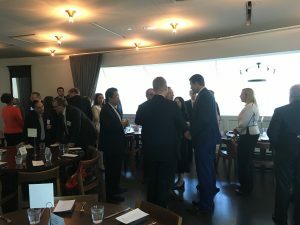 Below is a picture of the Networking Session prior to lunch. During lunch, Speaker Moore addressed the group spoke of the strengths of our state, transportation and infrastructure spending , our colleges and universities, community colleges and our quality of life that makes N.C. an attractive state. Above: Debbie Taylor (Harnett) Cindy Ingram (Wilson) Brenda Daniels (ElectriCities) Harry Mills (Granville) Chris Johnson (Johnston) Stuart Gilbert (Person) Joy Thrash (Lee) Bob Carson (Franklin) Julie Ann Roper (PSNC) and Ken Bowman (Warren).